Back in good ol’ Winchester, Virginia!! 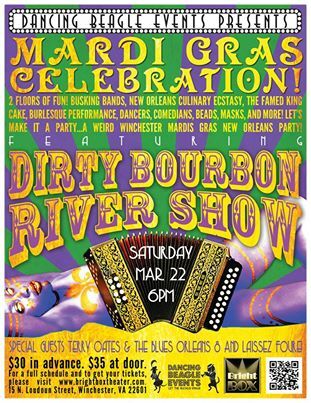 Folks this weekend is going to be jammed pack full of all things Dirty Bourbon! Not only will we be performing two nights at The Bright Box Theater, but we will also be filming for a new music video between the two sets we’ll be performing!! This video has been 4 months in the making, and this weekend will finally bring it all to an end, so don’t miss out on a chance to be a part of it, Winchester!! But that’s not all, the wonderful folks with Dancing Beagle Productions have also arranged for some beautiful burlesque, fire, alcohol, food, beads, masks and many more surprises!! Yours truly will also be sharing the stage with local rockers – Terry Oates & The Mudcats – and local swingers – Laissez Foure!! It’s all happening this weekend at The Bright Box Theater!! You know it’s gonna be good – just check out this poster for more info!! !